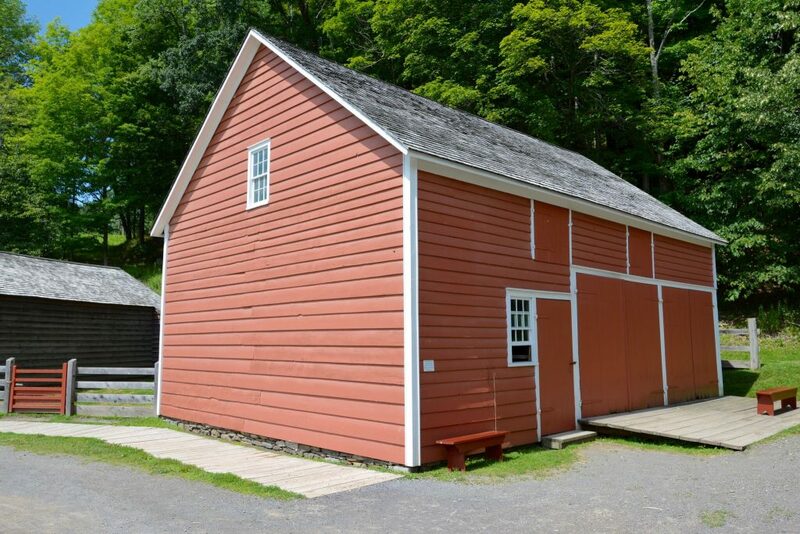 Abner Newton built this barn in the style of a traditional English threshing barn about 1790 on his forty-acre farm in Nassau, New York. 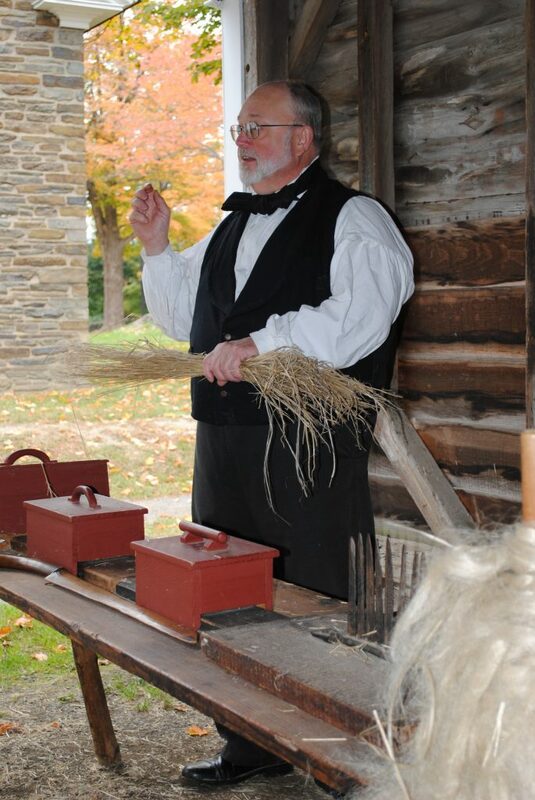 Smith Morey took over the farm sometime in the later half of the nineteenth century. 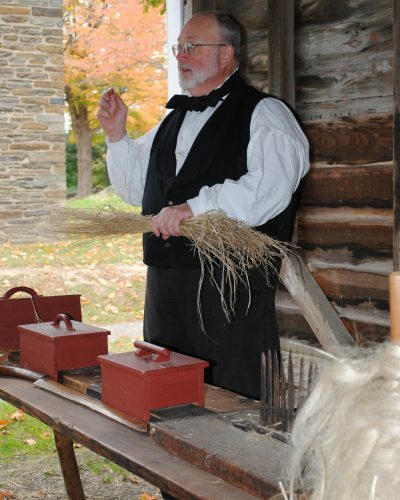 The Farmers’ Museum restored it to its 1845 appearance. 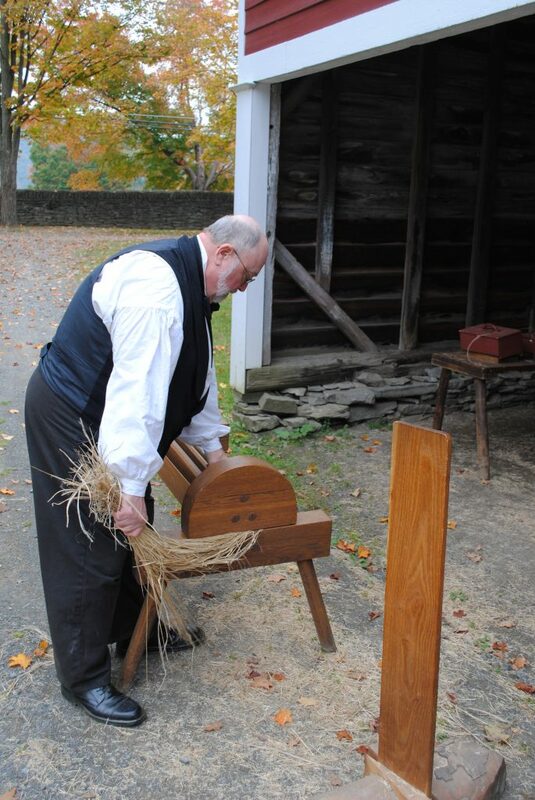 The architectural style resembles a three bay English barn designed for threshing and storage. 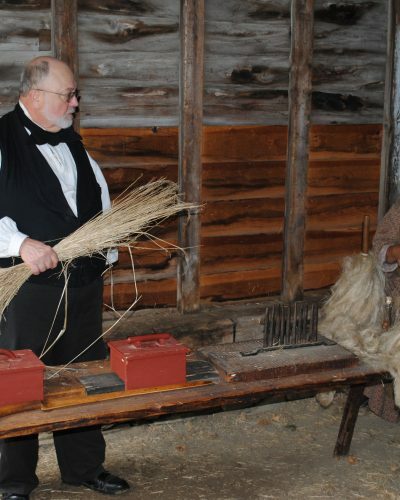 Many farmers began to convert these threshing barns to be used for a wide variety of farm animals. In Morey Drive Shed, you can still see where horses chewed on the barn posts. 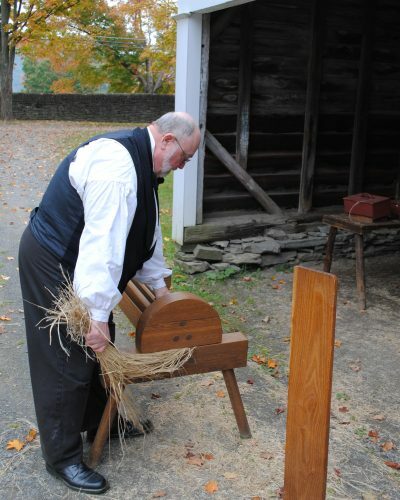 Morey Barn houses demonstrations on spinning and rope making. 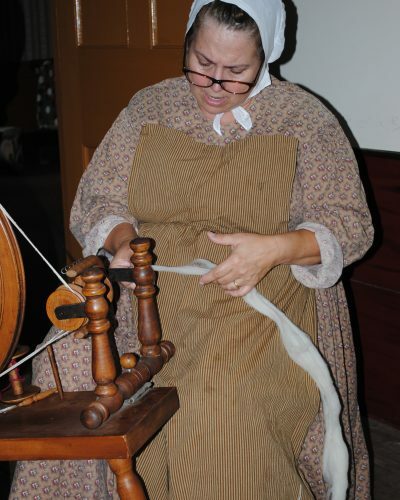 Linen fiber is a type of fiber which comes from a plant commonly called flax. This plant also produces edible brown seeds that are in some of our foods today. 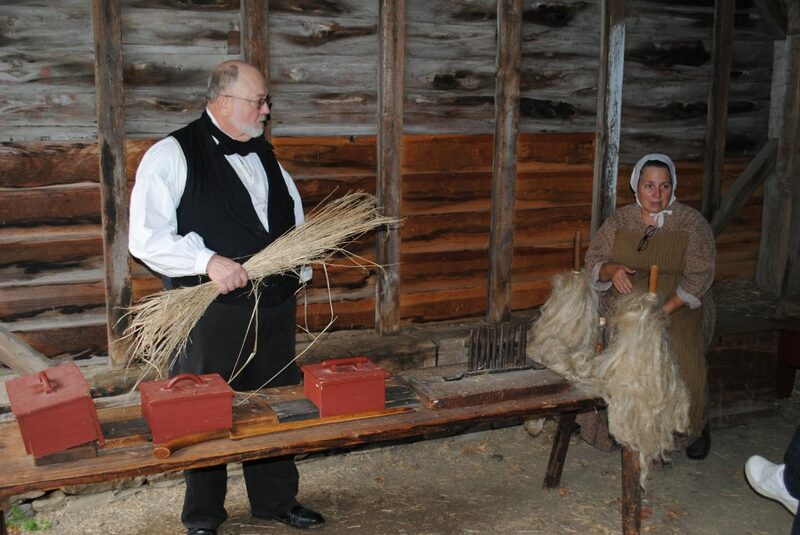 The fibers from flax grow inside the stalk of the plant, from the roots to the tip. 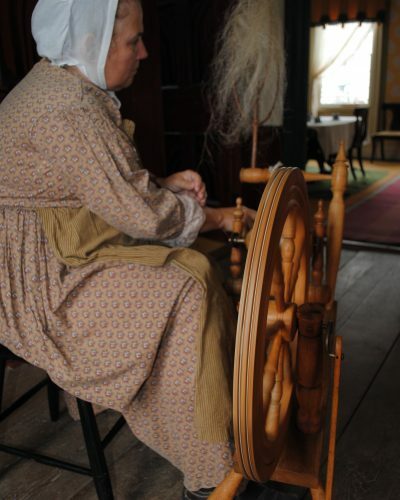 Because of that, they are one of the longest fibers that can be spun. 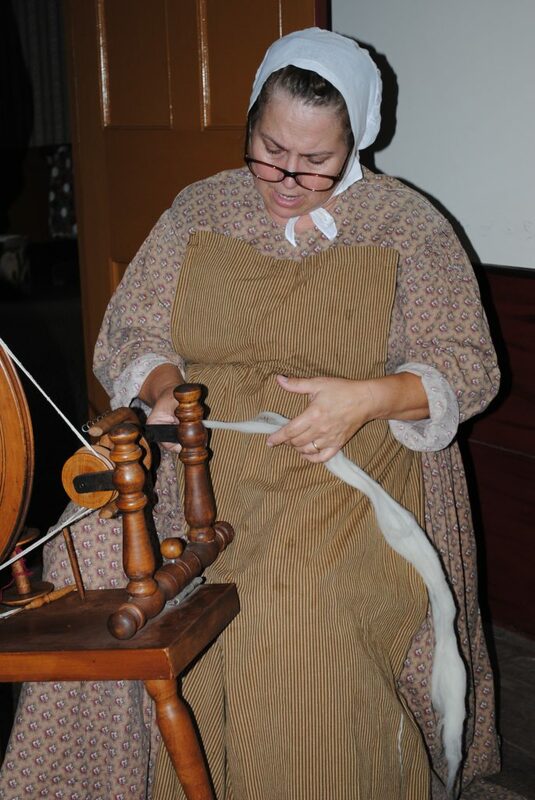 Spinning flax fibers results in linen thread. 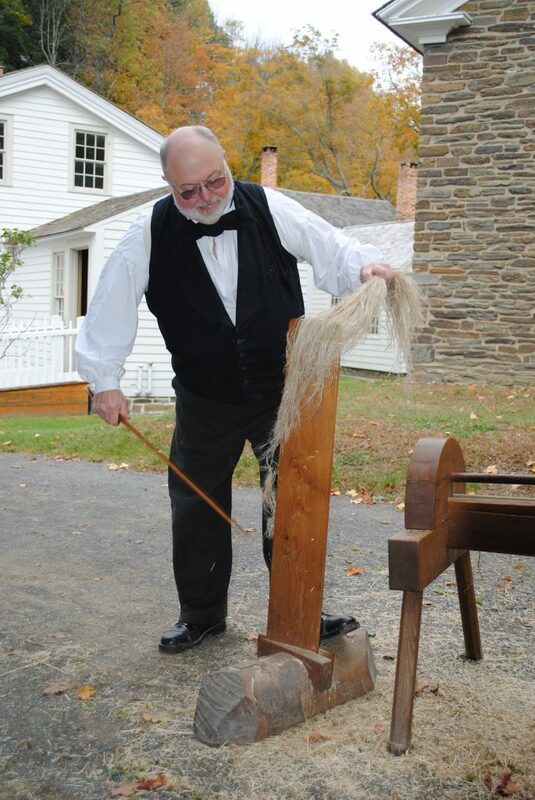 Flax is harvested annually by pulling out the plant with its roots to maximize fiber length. After drying for several weeks, the plants undergo a process called “retting” in which they are exposed to moisture to partially rot and break down the stalk. This makes it easier to isolate the fibers. 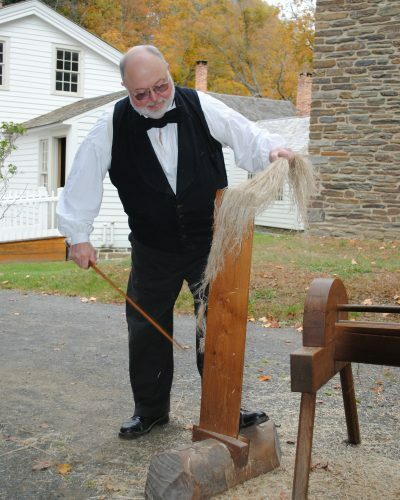 Flax bundles are weighted down and submerged in ponds or spread out in a field to be exposed to dew for a couple of weeks. 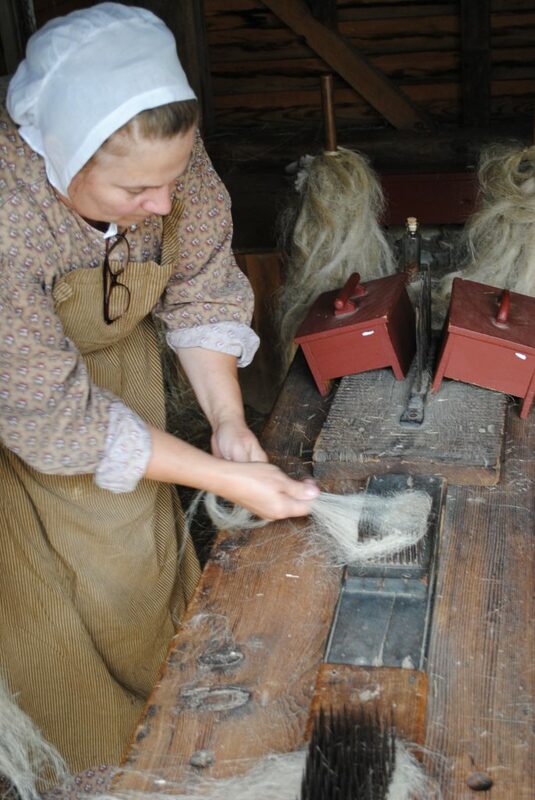 They are then spread out to dry again until they look like straw. This is when the most difficult part of the process starts. 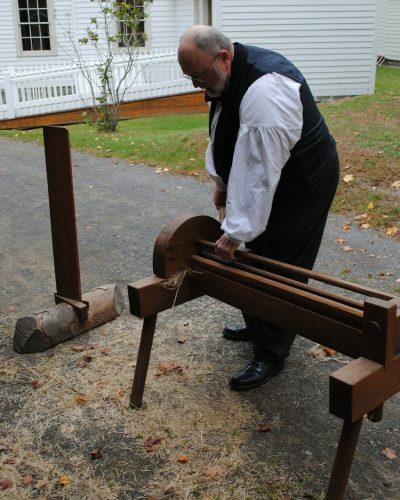 One handful at a time, the woody stalks have to be broken down using a large wooden tool called a brake. 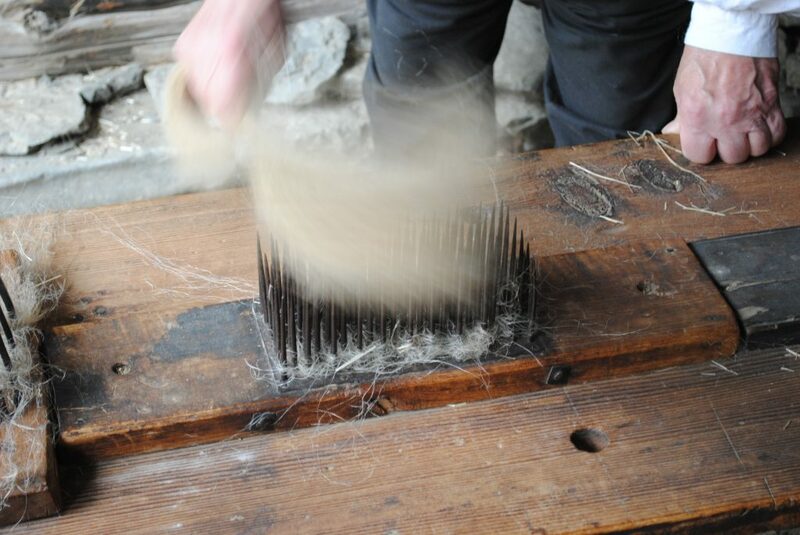 Then, the pieces of broken down stalk have to be separated from the fibers in a process called scotching. 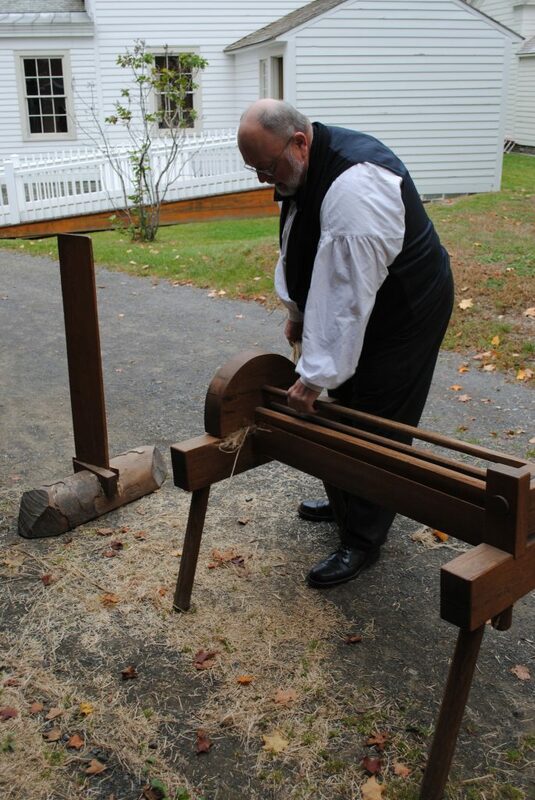 Scotching is using a large wooden blade to scrape down the length of the fiber and pull the woody bits away. 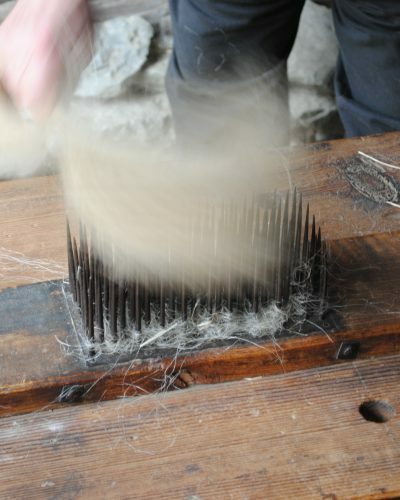 Finally, the fibers are repeatedly pulled through a comb of vertical nails called a heckle until they are smooth and polished. At this point, they look and feel like horse hair. 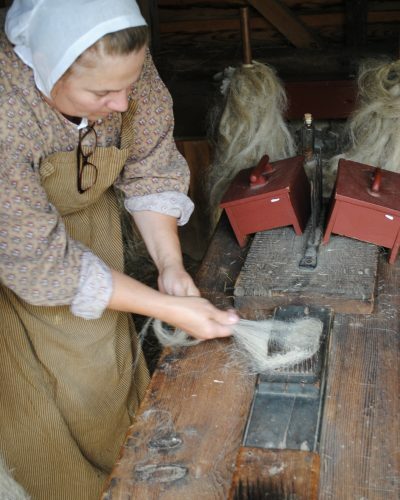 The fiber bundles, or stricks, are then spun by hand on a wheel equipped with a distaff. 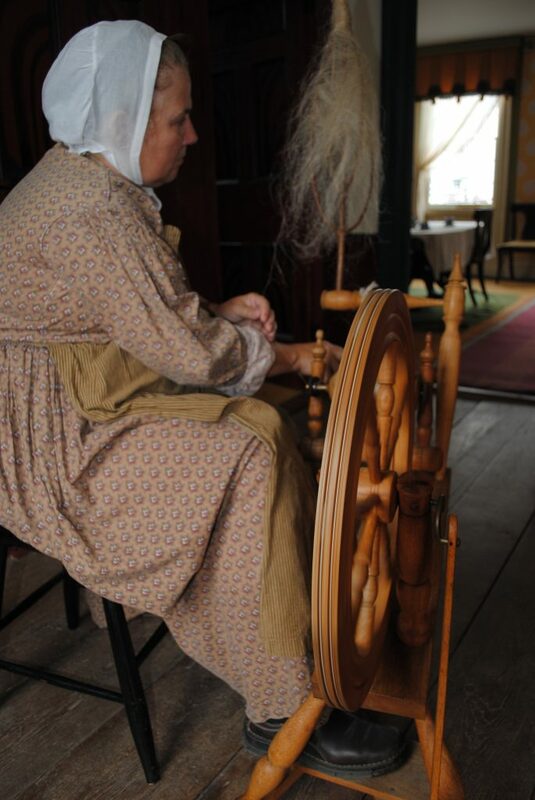 A distaff is a pole attached to the spinning wheel from which the fibers are hung so the spinner can grab them, one pinch at a time, to make yarn by twisting the fibers together.